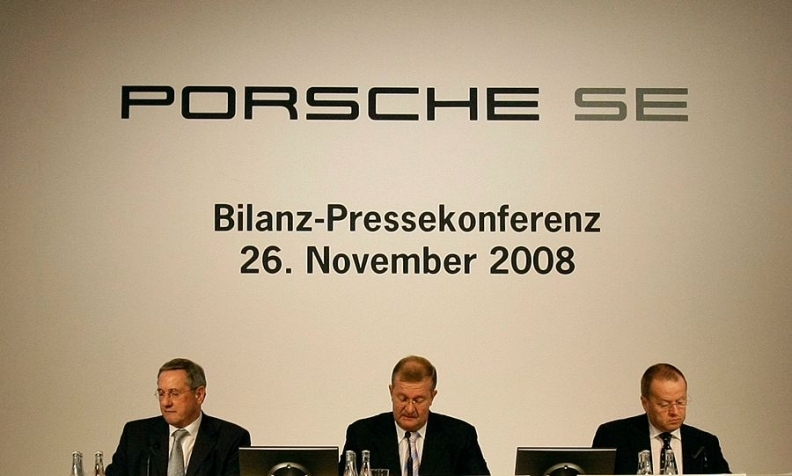 Former Porsche CEO Wendelin Wiedeking (center) is pictured next to ex-CFO Holger Haerter (right) at the company's annual news conference in November 2008 at a time when Porsche SE was attempting to take control of Volkswagen Group. BERLIN (Bloomberg) -- Volkswagen Group's cheating in diesel emissions tests isn't the only scandal involving the automaker as two former executives of the company's major shareholder, Porsche SE, face trial on market manipulation charges. Former Porsche CEO Wendelin Wiedeking and Chief Financial Officer Holger Haerter are scheduled to go on trial Thursday over their role in a failed takeover of Volkswagen in 2008. Prosecutors claim Wiedeking and Haerter didn't properly disclose their intentions regarding Volkswagen. Seven years ago this month, after weeks of Porsche denying any interest in buying Volkswagen, the company issued a statement that the company held 74.1 percent of VW and was seeking to acquire a 75 percent stake and control of the company under German law. The about-face cost Porsche dearly as the bid fell apart and VW ended up rescuing the sports-car maker. Along with lawsuits and regulatory and criminal probes against Porsche, the case generated a steady stream of headlines. Yet now, with the two highest-ranking German auto executives ever charged about to go on trial, the case has been eclipsed by the scandal at Volkswagen. "The whole issue is clearly overshadowed by the diesel scandal at Volkswagen," said Juergen Pieper, a Bankhaus Metzkler analyst. "Porsche was the problem child when it came to legal risks in the VW Group. This looks very different now." While VW is insulated from the trial, Porsche isn't. Plaintiffs in civil suits are seeking as much as 5 billion euros ($5.7 billion) in damages from Porsche. Lawyers for complainants in those cases are hoping that the criminal trial reveals evidence that could bolster their cases, which have been mired in the German legal process. In addition, some of Porsche's profits from VW shares could be seized. The trouble for Porsche SE started on Sunday, Oct. 26, 2008, when the company surprised the markets by saying it held 74.1 percent of Volkswagen, partly through options, and now wanted to buy its rival. The announcement caused Volkswagen's stock to jump as short sellers raced to buy shares to repay borrowed stock in bets that VW would fall. The plan backfired spectacularly in the wake of the financial crisis, drying up loans that Wiedeking and Haerter needed to finance the deal. The takeover bid collapsed and Porsche itself had to be rescued by VW, which bought Porsche's manufacturing operations, leaving behind only a holding company with the sports-car maker's legendary name. Both executives have denied wrongdoing. Wiedekings's lawyer, Hanns Feigen, said he won't comment before the trial starts. Porsche spokesman Frank Gaube said the allegations are unfounded. Porsche is an associated party to the case and if found guilty could have to forfeit any financial gains from the increased price of Volkswagen shares. Criminal market manipulation carries a sentence of as long as five years. Germany's financial regulator Bafin reviewed the disclosures surrounding the takeover bid and asked prosecutors to take over. The resulting criminal probe started out with raids at Porsche offices and the homes of executives, but then faced legal hurdles. A Stuttgart court last year dismissed the charges, but the ruling was overturned on appeal. Prosecutors also investigated members of Porsche's supervisory board, including legendary names such as former Volkswagen Chairman Ferdinand Piech and Porsche Chairman Wolfgang Porsche. The men denied wrongdoing and prosecutors eventually dropped the case. Prosecutors in Braunschweig investigating the Volkswagen diesel scandal may also have a long road ahead. "No one can legitimately tell how long the criminal probe at Volkswagen will take -- it could be a year, it could be several years," said Tido Park, a criminal defense lawyer in Dortmund. "So many individual factors play a role here, you cannot asses that from outside. If the investigation turns international, as a rule that means the matter will be delayed. At the moment it's totally up in the air whether there'll ever be charges or a trial." Hearings in the Porsche trial are scheduled into next year at the traditional German pace of one or two court days a week. "The Porsche litigation has been going on forever, there's a certain fatigue over it," Bankhaus Metzler's Pieper said. "Mentally, I have drawn a line under it. My gut feeling tells me, it won't have grave consequences for the people concerned."